Doug Benoliel arrived in gloves, laying stinging nettle samples alongside salal, wild mustard, and other common edible plants of the Northwest. 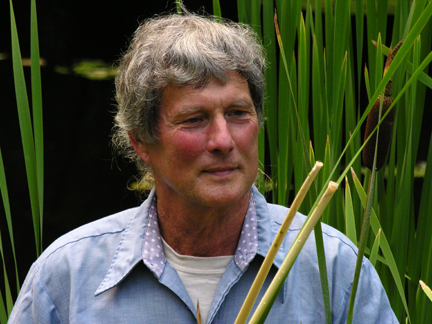 In a June 23 presentation at the Skagit Valley Food Co-op, the botanist and author of Northwest Foraging shared plant samples, foraging tips, nutritional information, and freshly brewed nettle tea. By the end of the session, participants had a thorough familiarity with some of what Benoliel called “top five” wild edibles—plants whose nutritional composition, flavor, abundance, and ease of identification make them ideal for the beginning forager—as well as a good understanding of one of the region’s most dangerous plants, the biennial Poison Hemlock. Personally, I left with a new aspiration: to let my goosefoot grow. According to Benoliel, lambsquarters (also known as goosefoot) deserves a place on the top five list: in addition to packing a lot of calcium and vitamins like A and C, it grows abundantly and is digestible and delicious. On this latter point, Benoliel didn’t simply ask us to take his word for it. He shared raw samples of the tender green, which grows in disturbed soils like garden beds (and which I’ve always plucked as a weed), then his wife Tamara Buchanan served a homemade crustless quiche. Its savory flavor, Buchanan said, came from lambsquarters alone in an otherwise unseasoned dish. “We have one growing in our unheated vegetable house,” Buchanan explained. “It’s getting the best of whatever we can provide it, and it’s gotten to be quite mammoth.” By repeatedly pinching the lambsquarter’s edible tips, Buchanan and Benoliel have turned a flimsy little volunteer into a densely branched, robust shrub with abundant new growth: welcome, vibrant, and nutritious. Learning about and enjoying the wild bounty is just one facet of Benoliel’s enduring fascination with plants. “They’re the theme of my life,” he said. Benoliel graduated from the University of Washington with a botany degree in 1969 and has spent the intervening years teaching about wild edible plants, providing native-plant landscape design and installation services, and, more recently, growing organic vegetables at the Lopez Island farm he shares with Tamara, whom he met in 1973 when she attended one of his foraging classes. 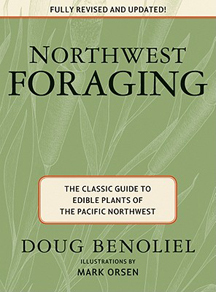 The second edition of Benoliel’s classic Northwest Foraging, now expanded with additional recipes, nutritional data, plant entries, and black-and-white illustrations by artist Mark Orsen, was published last year by Skipstone Press. “The publisher is extremely pleased, and a little surprised, that the second edition has been received as well as it has,” Benoliel said. A second printing of the edition is planned. For more information, including classroom sessions, and foraging field trips, email dougbenoliel@gmail.com. I saw the Google Alert for Growing Groceries added to and while trying to locate it (never did, the link went to the front page, with no info, and it didn’t turn up on the search; do I need to be a subscriber?) I ran into the article about Doug Benoliel. We were friend when he was in Totem Lake WA. I know you probably can’t give out his email. I’d love to say hi to Doug and Tamara. Could you pass along my email? Thank you so much.